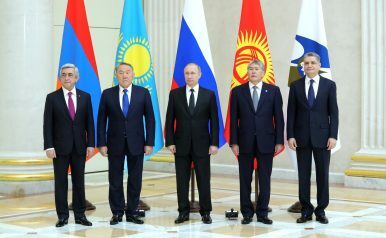 The EEU heads, minus Belarus, in December. After 24 months of bickering, slights, and stalled promises, it’s little surprise that the two-year anniversary of the founding of the Eurasian Economic Union (EEU) passed with little fanfare earlier this month. What Moscow once pledged as one of the world’s primary geopolitical “poles” has, instead, accelerated toward something its critics long assumed it would eventually become: a largely empty-shell organization, good for summits, photo-ops, and mutual back-slapping — but little more. To be sure, like the Collective Security Treaty Organization (CSTO) before it, the EEU isn’t entirely without impact. However — and, again, like the CSTO — much of that impact, if recent coverage is anything to go by, has been largely negative. Indeed, there’s an argument to be made that since the EEU’s 2015 inception, relationships between every single intra-EEU country have suffered, save, perhaps, for relations between Minsk and Astana, and between Moscow and Bishkek. The other relations — Moscow and Minsk, Astana and Bishkek, Yerevan and everyone else — have either flat-lined over the past two years, or worsened outright. Much of the souring, of course, has less to do with the EEU’s on-the-ground impact and more to do with Moscow’s decisions, ranging from the Kremlin’s counter-sanctions regime to the increased tensions Russia’s neo-imperialism has engendered in Belarus and Kazakhstan. But there’s a reason the EEU coincided with Moscow’s attempts at returning to international prominence and why other member-states, most especially Kazakhstan, have attempted time and again to slow Moscow’s pushes for everything from common passports to a common currency. While EEU officials continue making overtures to potential free trade agreements abroad, the EEU’s import, especially internationally, has fallen far short of what Putin first envisioned when announcing the group’s coming creation in late 2011. Indeed, it’s easy to forget that the EEU was, as former U.S. Ambassador Michael McFaul said, a “primary priority” for Moscow. Instead, the EEU has fallen flat, and coincided with steep drop-offs in regional trade. As such, maybe it’s little surprise that the group’s two-year anniversary passed with no fanfare. The EEU will likely continue for another two years yet, and probably longer, but any chance of retaining the relevance it once promised is, much like the CSTO, slipping by the month.